A lot of PExers find themselves searching for information on credit cards, and some posts are clogging up the forum. Because of this I decided to make a compilation where all major credit card threads, as well as other relevant credit card info, can be found in one place. I encourage fellow PExers to take some time scanning the following threads before creating a new or even a potentially duplicate thread. We have so many credit card threads already and I believe all important topics are already covered. So without further ado I present to you, The PEx Credit Card Repository. "I Cannot Pay My Credit Card." "May Nakukulong Ba Sa Hindi Pagbabayad ng Credit Card?" ^That's one of the reasons why I created this, para maiwasan ang mga duplicates (there are a lot already). If not baka sooner or later kailanganin na natin ng dedicated forum sa dami ng credit cards threads. :depressed: Anyway I hope it would serve its purpose. Well maintained useful thread. I also came across the website for the comparative study of credit cards https://www.bankbazaar.ph/credit-card.html which helps in understanding which credit card suits you. Oh my! Bakit kaya? MIA ako for a long time I have no idea what happened. Can anyone shed light on this? KuyaDanny? Apparently ginawa ko yang thread na yan last April kasi puno na yung previous HSBC thread I. I informed KuyaDanny about it, got no reply though. However, the following day my thread was closed and nag decreased ang number of posts ng first thread. Now the first thread is full again and KuyaDanny is MIA. I created that new thread and KuyaDanny closed it. Bakit kaya? may bad experience kaya si KuyaDanny sa HSBC? The original thread is still open and is not full (4991 replies). When it reaches 4999 replies it will be closed and the second thread will be reopened. Konting disiplina, mga kapatid. CHange is coming daw sabi ni Duterte. Masyadong maaga ang paggawa ng bagong thread kaya sinara ko muna habang hindi pa puno yung una. Hi I am a Relationship Manager from Unionbank. For personal assistance for any banking needs: Credit Card Applications, Car/House Loans and Consumer Financing; feel free to send me a message at 09175300785. Hi! This is Bry, sales associate of Security Bank. I am glad I was able to help more and more co-PEXers in applying for a Security Bank credit card and many are now enjoying the perks and benefits of it! "Up to 5% cashback on your essential expenses!" "Non-expiring reward points, exclusive promos and more!" "Enjoy the lifestyle you want with higher credit limits & more features." "Lounge access, concierge services, waived fees and more!" If you are interested, I am here to assist you all throughout the process. Only one (1) valid ID is required if you have an existing credit card from other bank with at least one year principal ownership and in good standing! Please note that other applications from our co-PEXers have been directed to another link for unknown reasons. Kindly double check on the web address when applying thru my direct link just to be sure that it will go directly to my portal. The suffix of the web address must be 0401. I CAN ALSO HELP YOU IN APPLYING FOR SECURITY BANK LOANS LIKE PERSONAL, HOME, CAR OR BUSINESS MORTGAGE LOANS! 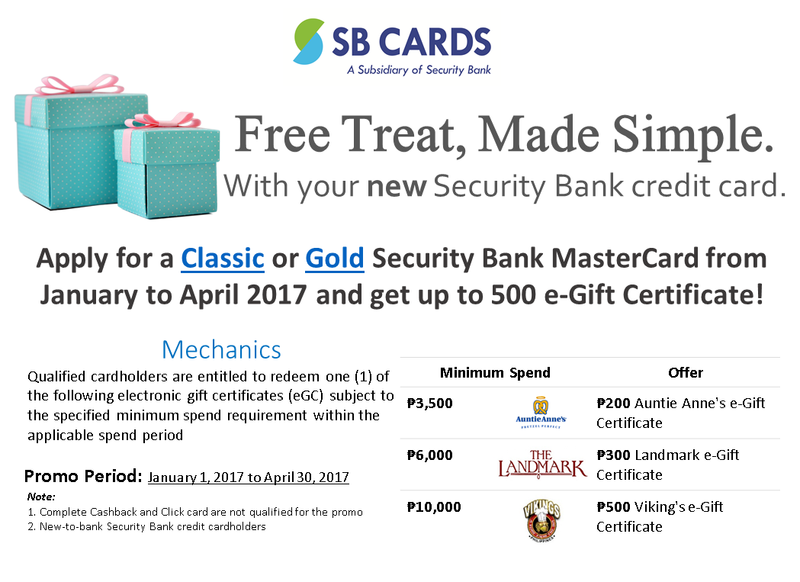 I am new to using credit card (in PH) after 30 years of existence, and so lately I am reading threads regarding CC just to educate myself on proper usage of it. It was not a necessity for me before since I can pay by cash or debit cards and I don't really like paying monthly dues and get into trouble of late payments, more so if you have to manage multiple cards. Plus, cc purchases are debts. However, I find them useful now than prepaid cards especially for flight bookings and online purchases. I know that there are lots of perks and promos from availing of or using CC but I don't get why some prefer to get CCs from multiple issuers. I have been reading post from users bragging how may CC's they have and how they used their card as reference to get more cards. I would understand if you have one or two just to back up if one CC failed or reached the limit. But let's say you have reached the limit of your card, isn't it time for you to pay in cash or use debit card or not buy anymore if you do not have the capacity to pay? Also, is it necessary to increase your credit limit if it is already above your monthly income? I have read some post that they can use their current card to apply for a new credit card with higher credit limit, then again adding another billing if you use these cards. I just find it troublesome to manage many cards. I am not against the idea and I don't intend to offend anyone who are doing it. I am just curious about it and want to know the benefit/fulfillment of having multiple cards from different merchants because I find more disadvantages than advantages. One reason I see is for status quo. I'd like to know your opinion, please. Personally I treat credit cards as financial tools. You can use the plastic as virtual money to pay. If used right, you can use credit cards as extension of your purchasing power, but of course, with a preset limit. I started having a credit card since last year, when I turned only 22. It was a secured BPI card and now a regular one. Now I have 2, the other one from BDO. I started at a measly 9k limit from my 10k holdout. But starting from that low limit, what I appreciate is that I really did learn how to manage my finances because I am bound only by the 9k limit. As an insight, I immediately require money where my salary couldn't provide me the amount that I need. That's the time I applied for personal loans but I never got approved - except for the BDO credit card with loan feature. To point out, Yes, there might be greater risks when having multiple credit cards from different issuers, but what you'll have is variety of perks and promos that you can't have on a single card. You just need to be very careful and proactive on monitoring the cards, and be diligent in trying to waive it's annual fees and other charges (if you can). I am actually using the BPI more, but I am using my BDO on emergency or unplanned purchases because, one other feature is that it got 25 days grace period before the due date. It actually spans 3 pay schedules so I can "split" my payments on unplanned purchases without having interest fees. It's like an unofficial installment already. And one thing why multiple cards work, (if you have discipline) is to use one primary card only. Using and maxing out two or more cards is just a big no-no. Lastly, I am looking to acquire one more card with no annual fee. I just want to maximize the promos and make it primary if the card performs well. And, for higher credit limit, since I've got low limit on my BPI card, actually I requested to convert it into a regular one and increase it's limit. Now it's 20k and yes, I am now maxing the limit of it and I am planning to request an increase again some after time. Why, you ask? Because having an "ideal" limit that works for you will maximize it's use. If you have low limit you can't plan your purchases right. What I do is that I am spending every after cutoff, and avoid when nearing cutoff. After my cutoff and my bill generated, I am going to repeat my habit, spend again, while waiting for my salary then paying in full my previous balance and so on. I never got any late payments and finance charges. Yet. You can't do this if you have low credit limit. That's my primary reason why I ask for a higher limit. But, yes, I agree with you that it's ideal to have a credit limit that's around your gross monthly salary. Maybe you can have it slightly above to have an allowance or buffer for your installment purchases. Currently, My separate limits for the two cards doesn't hover around my gross monthly salary yet but I am planning to have it raised around it, maybe slightly higher to cater installments. On a different note, some of the high limit card owners use their cards for their business. I am not actually at the level of someone with gazillion cards, with sky-is-the-limit credit limits, but like you, I do also want why they want to have more cards and how high credit limit cards benefit them. The benefit of having multiple credit cards for me is I get to take advantage of more promos (i like discounts and buffets... So having to eat at a buffet for less than the regular price is a good enough reason for me to get a card.) For the last decade I was happy with having a basic card of my own, supplemented by elite and premier cards by parents when the need arises. I stuck to that card and applied only for another primary card with another issuer as backup when I knew I could afford it. High credit limits are useful if you want to take advantage of airline promos. They're usually good for minimum of two persons, and economy-class tickets to the US, for example, would definitely need a six-digit credit limit. If you have a family member abroad, it's more advantageous if you use a credit card because of the promo price AND the points/miles you get compared to paying in cash. Those are the only reasons why I have multiple credit cards. From a basic card, I applied for an elite one to take advantage of airport lounge access. I have a frugal father (his frugality I somewhat inherited, but diluted by my mother's brand consciousness haha), and because of his frugality, I ended up paying for everyone's food (I guess we eat a lot) which amount is comparative to my international lounge access fee (they all had elite cards that gave them free access) had my father not insisted that we not enter when he learned that I would have to pay for access. I only applied for cards which have no annual fee or else assurance from other card users (through experiences relayed here at PEX) that such fee is easily waivable. Actually, if only my primary issuer just gave me the card I wanted, I wouldn't have applied with other issuers. (Still a puzzle to me why my application wasn't approved, since I'm qualified based on their requirements - but hey, that's how the ball rolled). Before, one advantage I saw in having my own card is that I don't get to be asked by my father what's this thing I bought at this place. (And the follow up question: what kind of place is that?! LOL) Hassle. The key really is: I purchase by credit only what I can afford. Even if I purchase items on (zero-percent) installment, I know I have money to pay for them had I bought them in cash. Now, though, because of affordable air travel and my credit limit could withstand it, family members make use of my credit line too. It is a bit bothersome to manage several cards though. I check my mobile apps every night. And if the issuer doesn't have a mobile app, I call the hotline to check my balance every now and then. Status symbol is added perk na lang. Dati, status symbol na nga yung magka credit card dahil hindi lahat nabibigyan nun. Wow! very well said, guys. I am learning a lot from this forum. Hearing from you two, it still sounds complicated but I know I'll get the hang of it and learn more as I use my card. I am excited to experience the perks that comes with it. It all boils down to having the discipline in managing your cards and expenses well while maximizing it's usage to your advantage.